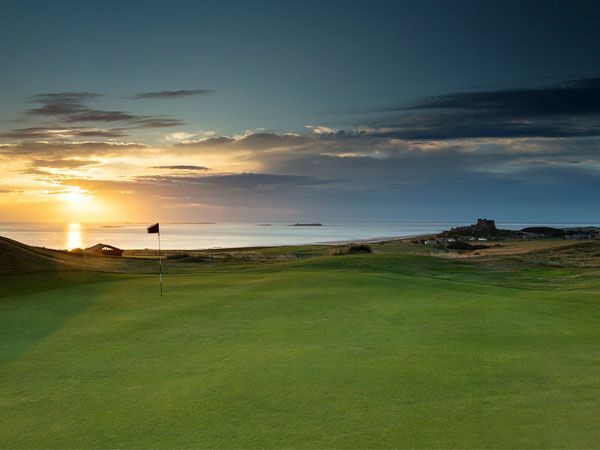 Bamburgh Castle Golf Club is a traditional and unique golf club with a timeless and welcoming character. 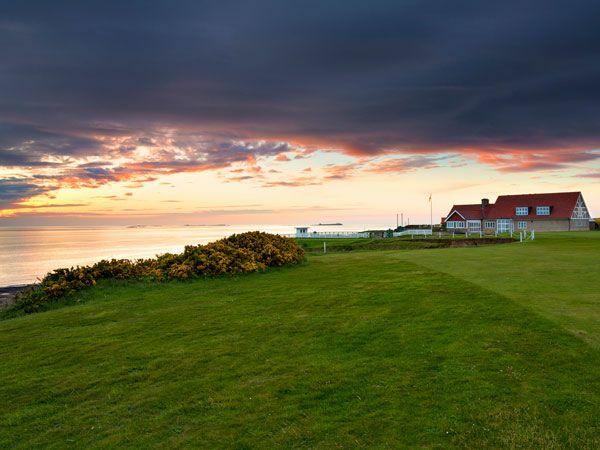 With our stunning location of he Northumberland Coastline we are one of the most memorable golf courses you will ever play. Don't just take our word for it, Bernard Darwin wrote in his 1920's book Golf on the LNER: "I imagine that the golfer's eye must be more often taken off the ball at Bamburgh than on any other course... the views are so compellingly beautiful that we really have to look, no matter how critical the shot." More recently Golf World said "This is quite possibly the most beautiful and beautifully situated golf course in all England." Once you have finished your round you must visit our recently refurbished and extended Clubhouse which retains the charm of the original 1904 building as well as our renowned hospitality and friendly atmosphere. We truly believe that the game isn't over until the 19th hole has been 'played'. Services include: golf with practice area, buggies & trolleys, food & drinks and a warm Northumbrian welcome! The club is also available for hire. 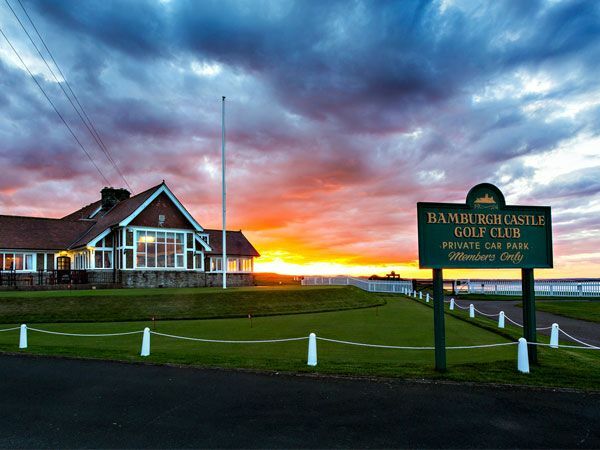 The Golf Club is located in Bamburgh, 5 miles from the A1, 8 miles north of Alnwick. Follow the signs for Bamburgh and turn onto the Wynding opposite the Lord Crewe Inn. Discounts are available for groups & after 2pm. Licensed to sell alcohol to members, golfers or guests signed in. My 16 year old son and I played the course on a sunny evening in late August. The course is short but very interesting and the views are magnificent of Bamburgh Castle, Holy Island, and the hills beyond. There is a nice relaxed atmosphere at the club and the members we spoke to and staff who helped us were all very friendly. What a fantastic experience. From the friendly welcome when we arrived, delicious bar meals and tasty cakes. On to the golf. What a great course. No two holes the same. We had all played Ganton the day before and this was comparable and in some of the guys opinion a better experience. Finally one of the members of staff, who regrettably I don’t know her name, went out of her way to bring my golf shoes, that I had left at the club, to the hotel we were staying. Thank you. Loved it and cannot recommend highly enough. I played this course on a Tuesday afternoon at 4.00pm when green fees are at their lowest. It was millionaires golf with hardly a soul to be seen. Many of the holes are not long but don't be fooled, this course is no push over. Just make sure you take time to enjoy the amazing views. I look forward to returning. We come to Bamburgh each winter to play our annual tournament. It is over an hour’s drive away from Durham, but I’d walk there if I had to. The drive down from the A1 is a little precarious, but as soon as you drive up, you appear to be in a different world. The coaurse is bang on the coast and occasional tee shots from hole 1 can get wet! The course certainly isn’t championship level, but offers its own demands with blind tee shots on several holes. The views are the reason for this being a truly magical place. With Budle Bay, Lindisfarne / Holy Island, The Farne Islands, Cheviot (Northumberland’s highest hill) and Bamburgh Castle, you are never short of breath-taking vista. Even if the weather or golf aren’t the best, this place truly is special. But it doesn’t end there… The club house has recently undergone an upgrade and has extended, which is rare in the golfing world. The beer, food, staff and cosy lounges with further great views, make this one of my all-time favourite golf course.